High quality compatible replacement purple extension wand assembly for Dyson DC58 / DC59 / DC62 / SV.. If you have misplaced your Dyson vacuum wand or have accidentally broken it, this high quality ..
Genuine Dyson extension tube for a range of select Dyson models. 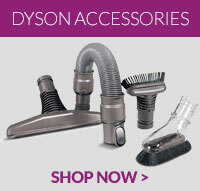 Please check the models list to ..
Genuine Dyson DC35 wand extension rod tube for Dyson DC35 vacuum cleaners. ..
Genuine part to fit Dyson DC19 vacuum cleaners ..
Genuine Dyson anodised blue wand extension tube for Dyson DC44 handheld vacuum cleaners. ..
Genuine spare part for your Dyson DC08 vacuum cleaner .. This is a genuine Dyson replacement adjustable telescopic wand for your Dyson DC08 vacuum cleaner. .. Compatible replacement fuchsia wand extension rod tube for Dyson V6 Absolute SV05 .. Compatible replacement fuchsia wand tube extension rod for Dyson DC44 vacuum cleaners .. This extension tube is a genuine spare part that will fit select models of Dyson vacuum cleaners. ..
A genuine part, this Dyson extension tube rod is designed to fit with selected DC08 vacuum cleaner m.. This item is a genuine spare part for select models of Dyson DC49 vacuum cleaners ..
Genuine Dyson fuchsia wand tube extension rod for Dyson DC44 vacuum cleaners ..